(The making of a lechona – latino pig roast)As a judge for the 2006 Food Blog Awards I had to to look at and evaluate a HUGE number of food blogs.I read so much filling prose, I saw so much beautiful photography.I came very near to catastrophy. Around 11:30 or so last night, after debating various nominations ALL DAY LONG with other judges, I very nearly didnt want to ever blog or surf blogs again! I know, its shocking, but true. I must be ok because here I am today adding even MORE content to the huge food blogosphere (for better or worse). I have learned a lot and gained so much perspective from the exposure to so many different blogs. (Even if it did leave me quivering with hyper-exposure overstimulation syndrome, something I will call HOS for short). I found the perfect visual personification of my experience over at Grab Your Fork‘s blog in today’s post “Cafe Mix, Sydney“. Visit, but for the love of all that is good and holy, be sure to be hungry before you go! 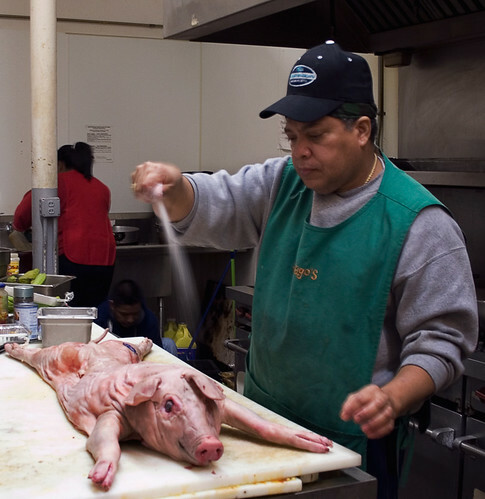 In the spirit of stretch-mark inducing cuisine, I will share a sparsely worded pictorial of what it takes to prepare a pig for a latino pig roast (traditional at Christmas and New Years). Be warned, we ARE talking about carnage and reality here. If you are a vegetarian or of a delicate constitution you may not wish to scroll further down. (Chef and pig at attention)This fellow was so patient. This look tells the story. He is wondering why in god’s name would a self-respecting woman with pre-teen daughter in-tow want to spend time in the bowels of a large latino supermarket, in a less-than-spotless prep kitchen, shooting pictures of a perfectly boring and routine activity like getting the pig ready to roast. On top of all that, my spanish is so bad (was my first language but it has suffered massive attrition over the years of living in gringo-landia) that it was hard to explain to him why I would want to take these pictures. As a result, I am now putting together a photobook on latino foods (really, honestly, look at my eyes, would I lie? ).Let us commence with the gore and oddly intimate aspects of pig roast making. This was a young pig, not suckling nor fully mature. Perhaps something like a junior in high school, still somewhat tender but with some meat on the bones. (Bone breaking – hacking really)I watched and was forced to deduce the purpose of things by observation, not interrogation. Maybe its better this way.Here the chef is using a meat cleaver to crush the vertebrae of the spinal column. Why oh lord why, do you ask? This is the first step in getting the carcass to lie flat so that it roasts evenly. He then pulled open the chest cavity and pulled down the rib cage, breaking it along the spine so that it would lay open. (Man, that feels so good)Another thing that has to be done to get this carcass to lie flat is to break the joints. This is the intimate odd part I mentioned. It is really reminiscent of a massage (a harsh one to be sure) and the chef was really quite meditative about the whole thing. He must have done MANY of these. I think 10 pigs for this New Years alone. (Salt bath)The chef sprinkled salt all over, inside and out. He also rubbed it into the skin and meat. (Lemon Juice rub)After the salt came the lemon juice. He sloshed the juice everywhere, very liberally.The pig sat after this treatment for about 15 minutes or so while the chef got the marinade going. This involved garlic, whole oregano, and mystery spices (or ones I just did not recognize in spanish – see, mysteries). 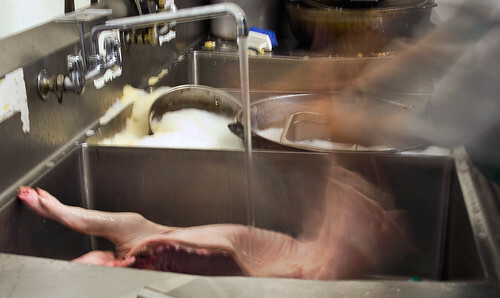 (A hosing)After those 15 minutes, the chef hauled the carcass over to the freshly scrubbed sink and he washed off the salt and juice. (The rub)What I didnt show earlier is the poorly shot and rather disturbing images of the chef gouging holes into the skin and meat. The skin so that it renders into crisp goodness, the meat so that it can accept the rub/marinade. The chef is methodically rubbing in the marinade, pushing it into pockets he made with a knife and all over the surface. (Ready for the long night)After the whole carcass is covered in rub it goes into the walk-in cooler over night. The chef said that he would rub coconut water onto the skin before roasting for 4 hours. The coconut water gives the skin a slightly sweet flavor and I think helps with the crisping and carmelizing process.He said that this would cost something like $60 and feed some 50 people (ok, maybe 10 of my relatives).Hope you enjoyed this. I am planning to do more of these in the future. One showing the making of salchichas (colombian sausages) (also see these pics) either by a butcher or myself (have to get a meat grinder 1st though). I also promise better pictures because today I will be taking delivery of a new flash bracket and 580ex flash for just these purposes! Whoa, intense photography. Great work, especially in the one that makes the pig look as though it’s smiling. I’ve been photographing so many pigs lately that I’m starting to develop a snout. Come visit: I’ll take you to see my butcher guy. Great photos Nika! A little shocking but I think it’s good to keep in touch with what we’re eating. I’ll be looking forward to more of these! Wow. Can’t wait to hear what it tastes like! Great photos! And btw, glad you enjoyed the Cafe Mix post! If you thought it was a visual binge you should try digesting it all! lol. Sorry that this post was a shock for you all. I grew up with this so to me I am just seeing the “recipe” and not the gore so much. Perhaps I should have been more sensitive? So this visit you see shot here, it was very tame for me. Jeez I sound like a cave-person now! Its just that outside of the US, your food really IS closer to you if you have any connection at all to the farm. Nicole: glad you liked it! Heh, maybe I should have taken pics of when I slaughtered out guinnea hens. They just about killed me. The other chickens and I were in shock for days after. Dont raise guinneas for meat, they are extremely spirited and tenacious creatures (and LOUD at roosting time). Helen: I would not have been able to digest a fraction of what you showed in those pics. Just no way! Alas, this was not my pig so Ididnt taste this one. Roasted whole pig is delicious. The skin, if treated correctly, is divine! I grew up watching how chickens, pigs, goats…. 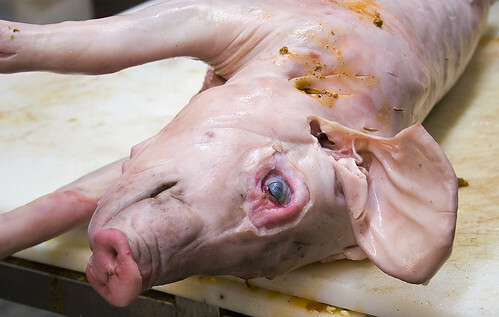 everything in Colombian gastronomy used to get slaughter in my eyes to be eaten just a few hours after. I even killed a little pollito when I was 5 after watching how they were killing gallinas hahahaha…. I just didn’t know I wasn’t supposed to do such a thing lol…. but that right there shows you how involved we are with our gastronomy. It’s posts like these that make me thank god for YOU, for blogging, for pigs and for the internet. This goes WAY beyond just everyday blogging and is so informative and revealing. And as gruesome as it is, I can only imagine how delicious the end results are. Wow. cool… great to see the beginning of the end. Wlliam: your work is amazing! I am glad you like this post. Usually I am not bothered by this sort of image (butchering) tho I did see a shot on Flickr of a pile of pork spinal columns and that bothered me! If I ever get a chance to go to Colombia again, I will look you up. We can cruz the local mercados. Wish I could come down and do a photoseries on Colombian food (street, market, home, restaurant, campesino, etc) but I do not have the funds for that, but I can dream! I just returned from Columbia and we had Lechona for Christmas dinner, It was wonderful and I am hungry for it again. Excellent. great site, with lots of information, we are doing our first pigroast this weekend so your experiences will be very helpful. NIKA BY FAR THESE ARE THE BEST COLOMBIAN RECIPE I HAVE SEEN. I WAS RAISED AROUND COLOMBIANS AND MY HUSBAND IS FROM BOGOTA NO ONE CAN EVER GIVE ME A RECIPE. BUT THANKS TO YOU I AM DOING GREAT SINCE COOKING IS MY PASSION. I NEED A RECIPE FOR TAMALES CAN YOU HELP ME? I LOVE THOSE COLOSSAL DELICIOUS TAMALES. I AM A REAL FOOD LOVER. Awww, glad you found them of use!